When the world thinks of Africa, fashion is not the first thought that comes to mind. Images of famine, poverty and political turmoil consume the public via major media outlets. However, most don't realize the value and potential in this vast and beautiful continent. There are 53 countries on the continent of Africa. All of which have various cultural differences and some similarities. When it comes to fashion, one commonality is that of the bold prints, bright fabrics and uniquely cut designs for both men and women. You won't find the style of dress anywhere else. This summer Arise Africa Fashion Week debuted in Johannesburg with the goal of putting the African Fashion Industry in the global marketplace. The week was filled with the creative talents from across the continent including Nigeria's Tiffany Amber, Ghana's Christie Brown and South Africa's Thula Sindi. The Designer of the Year honour was awarded to South Africa's David Tlate. His works embodies the sleek sophistication of western style with a hint of African incluence. 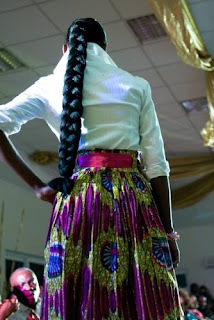 Eyola, from Nigeria was awarded Most Promising Designer. It was clear through the construction, choice of fabrics and overall tone that all the featured designers were set to capture the attention of the world. Traditional fabrics, mixed with contemporary styling were the key to making these items appealing to the world.